I woke up this morning to the most spectacular sunrise I’ve ever seen. I would have loved to have shared it with you, but it was something like 4 in the morning and I could only stare at it through the curtains. My camera was likely somewhere, but I wasn’t all that keen on dealing with anything electronic at that hour. I just wanted to look at it. Also the Queen Mary 2 comes with plenty of history, and around the ship the walls are lined vintage photos and paintings that tell the story of various other vessels that once made their way through the oceans. Unlike other trips, and ships, this one has more of a purpose; most riders are taking it for the sheer experience of riding across the Atlantic. There’s not a lot of people partying it up or parents trying to calm overexcited children. And I have nothing against people partying, or kids. It’s just that everything has its place and the tone of the ship is somewhat sedate. Some of that has to do with the ship having a dress code for various events, which might be responsible for keeping everyone on their best behavior. And some of it likely has something to do with the journey; it’s not everyone that wants to make a week-long trip across the Atlantic and I can imagine in the winter, it can get a little rocky on the open seas. But right now it’s mid-July, the weather is quite nippy, and for a little nap on the deck, the ship provides plaid woolen blankets to snuggle under. Quite a few things on board are decidedly British, from the baked beans available for breakfast to queuing up for signing up for fitness classes. I’m not British, but I’m finding a lot of their customs rather quaint and fun to participate in. I had an excellent gin martini at the bar last night. Interestingly, cocktail prices are surprisingly gentle – maybe I’ve been living in Paris too long, but my drink was only around $7. (At the Ritz in Paris, a martini hovers at around €25.) But as I get older, I realize there’s only so many cocktails I can have in one sitting. And malheursement, one or two seems to be my limit, a big switch from those days when four or five didn’t affect me all that much. 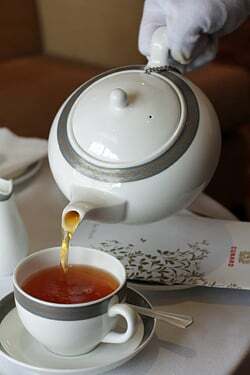 I’m not normally a big tea drinker in the afternoon but I do like the idea of eating any time food is offered, and since it would’ve looked funny sitting there gorging on finger sandwiches and dainty desserts, tea is was. 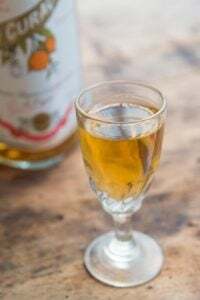 So the white-gloved waiter poured us Rooibos, a South African “tea” that’s I always say I’m going to buy some when I get home – because I like it so much – but I never seem to get around to doing so. So back out we went, to walk around the deck, dodging joggers and people out for a stroll, to gaze at the ocean, which has been gently rocking us to sleep at night. It’s a lot milder than I expected and a few seasoned travelers told me that the Queen Mary 2 is the steadiest ship they’re taken. I’ve only been on a few boat trips but the other boat’s stabilizers vibrated like the magic fingers and when I got off, it took a few days to calm down. This ocean liner moves slightly, not enough to really be perceptible, but every once in a while, there’s a gentle drift to one side, and then we’re back on an even keel. But all is pretty calm in the middle of nowhere, somewhere far off the coast of Britain, with not a single other ship in sight. Just the churning ocean. that reads like a trip of a lifetime! This sounds a very elegant trip! This looks much different and more enjoyable than those Caribbean cruises!! Gosh, I would never get on those boats! Ilke: I have been thinking about taking this trip on my own for a number of years and am thrilled to be taking it. I am going to ask them to see some of the other rooms, because there are different price points for trips like this and just looking at summer airfares, the price gap between traveling on the boat and the plane isn’t as great as I thought. (I was planning an overseas trip and the coach airfare was astounding right now.) I’ll write about the various rooms later.. Sounds heavenly. I would love to cross the Atlantic on a boat one of these days. Thanks for sharing this, David. I’d never really though about crossing the Atlantic by boat before but this does look wonderful! I’m hooked already! I hope there are many more tales of the sea, or at least riding on it, to come!! Wow, what a dream vacation…. Good grief, David, I know your life hasn’t been all perfect but this bit sounds damn near ideal. Enjoy it. this sounds wonderful, beautiful pictures! Rooibos tea is my absolute favourite, have you tried a red espresso? We only did one cruise several years ago, from New York to Bermuda and back. It was just the right amount of time at sea for me–about a day and a half or so. Waking up that Monday morning to arriving in Hamilton was very pleasant, also knowing that we would be docking shortly was also a happy thought. The seas were very calm on the trip there and the food was amazing and very plentiful. 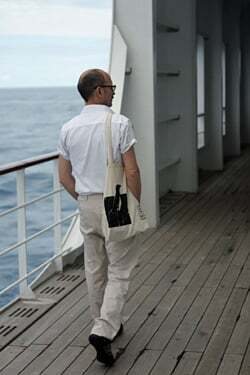 The full day at sea on the return didn’t seem as rocky as it evidently was for some, as I recall the ship’s doctor out with a basket of syringes of anti-emetics. I’m sure that having the time as you are on the ship ( plus the time needed for the trip across the pond) was very relaxing and enjoyable. And when you arrive in NYC, the calm will be over. It’s hotter than hell here as well, so prepare yourselves!! It does sound lovely – and I’m drooling over your afternoon tea! 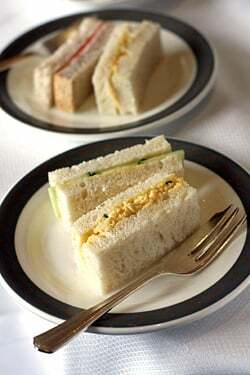 Incidentally and FYI, we call it an “egg mayonnaise” sandwich, rather than “egg salad” (salad always implies raw vegetables here – an egg and salad sandwich would have lettuce, cucumber and tomato in it. And quite probably mayonnaise). i’m glad that you’re experiencing this. i’ve done the Atlantic Crossing (both ways) twice on Italian Ships and the Pacific Crossing to Hawaii as a child on military ships. all were wonderful! i have no desire to go around in circles on a cruise. i like to be going somewhere and enjoying the crossing along the way. the QM2 has to be very special though because of the history behind Cunard Lines. the food looks wonderful! There is plenty of redbush tea available in the US and England. I guess I didn’t notice in Paris because I was stocking up on Vervaine. I’m thoroughly enjoying your tweets and humor. Following your journey on the QE2 is wonderful. Your photos are outstanding, so I must ask if you have a professional photographer along with you, or are you the photographer? If so…your camera? As a traveler, I always struggle between the difficulty of hauling camera equipment, or winging it with smaller cameras. Freda: Thanks! I take all the pictures myself. You can read more in the Food Photography post under “Categories” (in the sidebar). Tania: Don’t know what a red espresso is~? Three-Cookies: The first time I took a trip like this I was concerned that there would be a lot of heavy drinking. 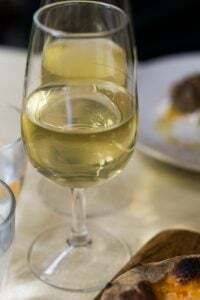 But that hasn’t been the case and most people have wine with dinner, and perhaps a cocktail (or a beer) before or after. Wow!This trip seems really fantastic to me!And I guess you are right calluing it “experience like no other”. Sandwiсhes look quite tasty and the sea is just marvelous! I have always wanted to make the Atlantic crossing. It’s not likely that I ever will, but it’s wonderful to read about it. My best friend and I have always dreamed about taking that trip. It’s a good thing I’m about to head to Scotland, because the thought of cooler temps would drive me crazy otherwise. The southern US is HOT right now. So very hot. Wow, it is so cool to be reading a blog post by you, somewhere far off in the middle of the ocean! David, I think you were born for the Queen Mary. Congratulations on your voyage. Ah David, I was on one transatlantic crossing in September–many years ago. I will remember this experience for the rest of my life. There is nothing like being on a vessel separated from the world, its own microworld–so romantic, so stilling and so beautiful. I am so pleased you are enjoying it!!! Beautiful post David. Your words really bring this alive for me and I can imagine the boat gently gliding along. Your photos are beautiful too. Enjoy the trip! This is the sort of adventure I positively dreamed of when I was little. Still do! Lovely looking scones. What is the correct shape or is there one? Round or wedge? Ahem. Calling the Queen Mary a “boat” is like calling a croissant Wonder Bread. The ever so proper term is “ship.” Cunard will love you if you make this slight adjustment. Kate: Am not sure. 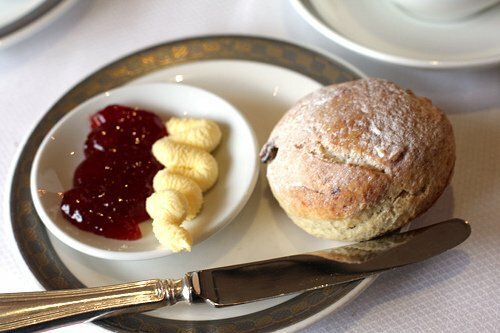 I know I’ve never seen the American-style scones with all sorts of stuff in them during my few visits to the UK. Most were round with a few raisins in them, such as these. I don’t know if the wedge-shaped ones are traditional as well. I was in the kitchen with the bakers this morning and they were cutting them all out. I’m going to report on those shortly. Sunchowder: It really is something if you think about it. It’s not really a cruise but a real ocean liner. Kelly: Am not sure of the difference but I did make those edits. The connection to the internet in the middle of the ocean is really spotty. Sophie: Me too! 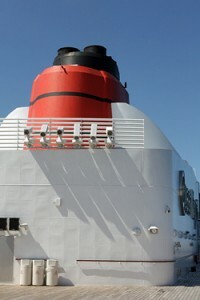 I remember seeing pictures of the Queen Elizabeth boat with the red chimneys when I was a kid. David, I’m so jealous. I would love to have afternoon tea on the QE2. I can’t recommend rooibos tea enough. Apparently it’s rich in anti-oxidants and is caffeine-free. And the flavor is nice without being so floral like herbal teas tend to be. When we had tea at The Berkeley in London, we ordered a tea called African Amber which was just delicious. So good that we asked our server for the name of the tea company and he said that it was made by Mighty Leaf which is a San Francisco company. I am not a big cruise person but this sounds very relaxing. Where do you end the cruise? Are you staying in the States until the Chez Panisse reunion? I discovered Rooibos tea a few years ago and is my favorite herbal tea since I can’t drink caffeine or decaf(causes migraines!). Mighty Leaf Organic African Nectar is the most amazing tea…could never drink anything else. Tell more! We are doing the Eastbound crossing later this year-can’t wait! What about les pâtisseries? 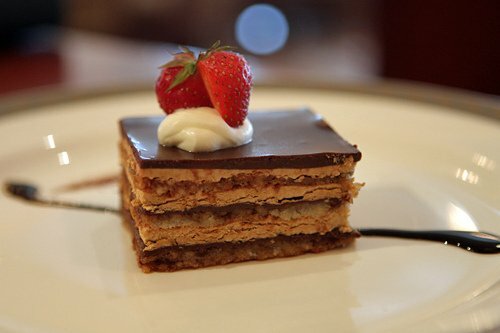 Can you have a millefeuille and if so have you had one? Baba au rhum? Eclairs? 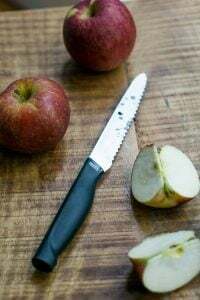 Tarte aux pommes? 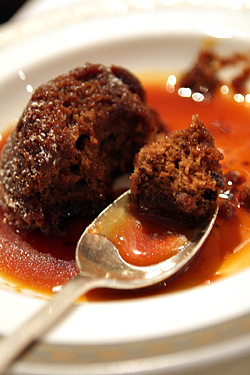 Chocolat fondant? When I went to the Bahamas on a cruise, I expected piece and quiet, with a gorgeous spa and glass elevators. I got the glass elevators. Nothing much else. Screaming kids, 75 freakin’ dollar seaweed wraps and saltwater pools. So envious, David. Please tell us more, more, more about the food and the service, which I imagine must be impeccable. The photo of the deck chairs brings to mind an old Fred Astaire & Ginger Rogers movie. Any women in evening gowns? And are men still required to wear a dinner jacket? In any case, I’m picturing you in one, elegantly. Everything looks wonderful. Like Ann K., I’m picturing Fred and Ginger walking along the lido deck looking very stylist and breaking into a dance number. Enjoy your cool temperatures, it’s very very hot in New York today. High of 102F (or 39C) today. Dogs are most welcome to sail on the QM2. There is a kennel on 12 deck and the dogs are released everyday to get some fresh air. They are not, however, welcome in the dining room. Hope to see some pix of the pub – how is your trivia game? Thank you for sharing and keep ’em coming! A gentle rocking tale of a journey. Uh, huh, it’s just toooooo sedate, something dramatic’s gonna happen . . . you’ll be in America’s tabloids before you hit land. Can’t wait for that dig in the dirt post. Nighty-night! Hi David …Seeing your photos is bringing tears to my eyes. I meant to tell you yesterday to make sure you tried the afternoon tea. It is a tradition that can still be had in parts of Canada. 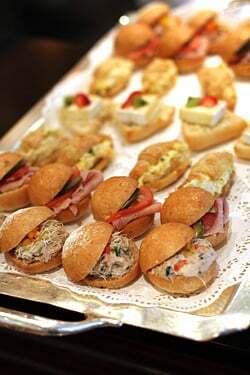 The best tip I got was to skip lunch on the day I was taking tea, so I had room for all those lovely little sandwiches! Also, when you are at the bar, have a Pimms Cup. It is a gin based alcohol, made like a sangria, using melon, strawberries, and other non-citrus fruits, with a stick of cucumber. Different looking, but very tasty!! Thanks again for the wonderful photos. A year ago this week I was there, and having the time of my life. You are crossing in the same direction as Cary Grant and Deborah Kerr did in “An Affair to Remember”. What fun !!! The QM2 is an ocean liner and is built to travel across the Atlantic, unlike those cruise ships that are not built in the same way. Given your celebrity, you will likely et a tour of the bridge – very exciting !!! I’m so jealous David! It looks like an amazing trip. Enjoy, and thanks for sharing! I’m probably giving away my age now, but I did this crossing both ways in 1958 when it was cheaper to cross the Atlantic by ship than flying! I travelled with Canadian Pacific liners and enjoyed it immensely once I got over the initial sea-sickness! I envy you travelling on the QM2. I’m incredibly jealous. What a relaxing way to travel – I’d love to do that someday. Beats the rush to the airport, the sitting around, the cramped conditions on the plane, and the awful jetlag! Keep the pix and postings coming! 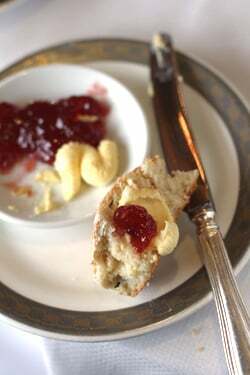 On scones in England: plain, fruit (with sultanas) or cheese. Maybe cherry if being really fancy. Always round, never wedges. Best still warm, and with lots of butter. 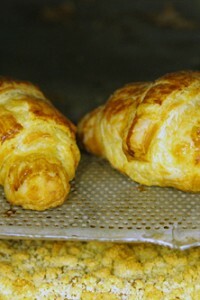 But having seen American wedge type scones lately, they do look delicious too. 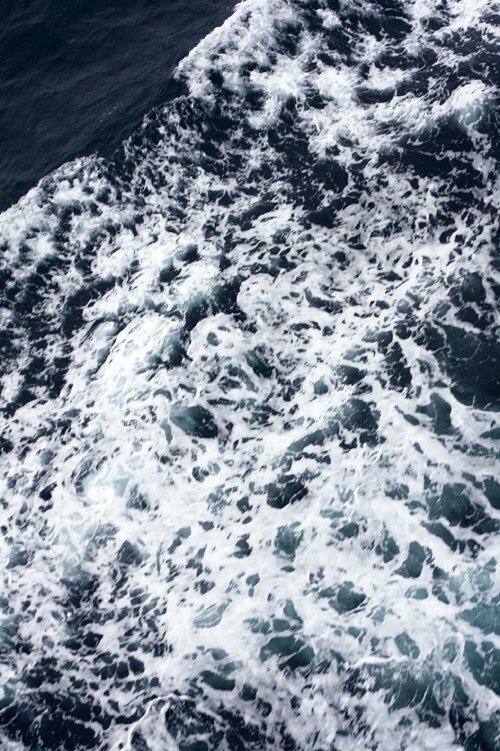 Loving the pictures of life at sea. Very posh! David. I am so, so, so jealous of you. I hope you have a balcony. And even better I hope you are dining in the Queen’s or Princess Grills. For years Cunard had the best food at sea. I was always being spoiled by Brian my server on QE2. And on Cunard you can always order the “specials” May I sugguest as a dessert the “druken apple” And if you really want to be spoiled go on the World Cruise or part of. By the time you get to Singapore, the first thing to do is run to Burger King or KFC to have a bit of taste of home.I hope you have a wonderful trip and don’t foget to buy yourself a QM hat..Some day I will tell you the sttory of all the stolen dessert spoons by the passengers on a trip through the canal. David, could you comment on how difficult/easy is it to post to your blog from the middle of the Atlantic? Did you need to take any special equipment with you? Thanks. Love your blog. Read it religiously. When we moved from Italy back to the US I thought it was the perfect opportunity to take that transatlantic cruise I’d dreamed about since seeing “An Affair To Remember” way back when. When the price of a 13 night TA cruise from Rome to Ft Lauderdale dropped to $399 (per person, inside cabin), I booked it! Our cuise (Celebrity) might have been a liitle more casual, or at least had the option for more casual attire, which was a plus for me! Still, we probably weren’t the ‘typical’ transatlantic cruisers, preferring to book our own land tours or wander the ports on our own. It was an amazing experience, as I’m sure you’ll agree! This may be the closest I ever get to crossing the pond by ship. Loving it…thanks for sharing your voyage, David. When you get around to trying Rooibos in Paris…Mariage Frerès “Bourbon” (#633) is the best! I have friends travelling on this very voyage, and thought I would have to wait some time to hear all about it!! But here you are too David, already sharing the delights of the QM2, its food and surroundings with others. Merci bien! Scones can be wedge-shaped or round. I do know that English scones are less sweet than American ones. It’s simple David. Your blog (I hate that word) makes me really happy. Keep up the good work. I love the variety in your blog. Having recently returned from a cruise on the new QE I can attest to the quality of a Cunarder. 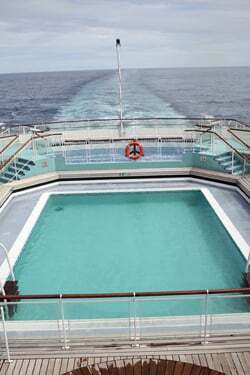 Will do a ‘pond’ trip on the QM2 in due course. Good report. I like the several references from people to the Astaire-Rogers movie “Shall We Dance.” When they are boarding the ship early in the movie, it looks like Ginger’s character has about 17 pieces of luggage (and a dog–the song “Walking the Dog” is played in the background while they are indeed walking the dogs). David made a reference very early in these comments to the passage not being as expensive as you’d think. He’s right–the less posh cabins (no ocean view or whatever) really aren’t that bad, and you don’t need a fancy cabin, do you? That’s really mostly for sleeping! Dear Child and I are enjoying this vicariously, you are blessed indeed. But I’m afraid that the Bud-drinking compatriots will be a rude recognition upon land, as well. Beer in America has evolved in your absence (although none shall pass my lips. Grands vins exclusivement) but alas beer drinkers, not so much. Bon continuation! I’m not gonna lie, I’m 24 and one to two drinks is pretty much my limit. So there’s that. Lucky bugger – a cruise is on the top of my bucket list! Sounds like you’re having a lovely voyage David. We’ve heard so many wonderful stories of the Queen Mary over the years. When we first moved to Europe for a three year job, my husband and I decided that we’d definitely take the Queen Mary for our return trip back to the US. Three countries and almost ten years later we’re still here enjoying all the ups and downs of life in Europe. Someday we’ll take that wonderful trip on the Queen Mary…someday. Sounds and looks like a real pleasure cruise…Just tell us what are you reading….Oh those scones….I am having breakfast and longing for one…or.two! 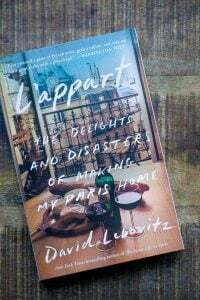 David, after reading about your trip, I told my husband that I want us to fly to Europe, see some of the sights we have not seen, and come back on the QM2. I have always said that I have no desire to go on any kind of cruise ship, but you have definitely inspired me! Thanks for the wonderful pics and your interesting words! Keep having fun! Our family did a crossing last year from Southampton to NYC, and your wonderful pictures bring back some wonderful memories. Besides some mighty civilized dining, we enjoyed trivia in the bars, fascinating lectures, and strolling the decks when the weather allowed. I can’t wait to hear more! Also, for those with little ones, the nanny program is outstanding. Thanks, David. We will be celebrating our 40th wedding anniversary soon…and this sound very appealing. Enjoy! I made four crossings with my family as a teenager back in the ’50s on the Holland-America Line’s all-tourist-class ships They’re among my fondest memories. In my senior years now, I’d dearly love to do another set of crossings on the QE2, but I’d be able to afford either the fare or the fancy clothing, not both. 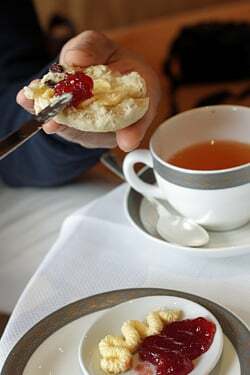 traditionally, english scones are usually served as rounds in tea shops and high class establishments. The scones served in wedges are more likely to be made by home bakers catering for workers on farms etc or just because they involve less fuss to cut out. 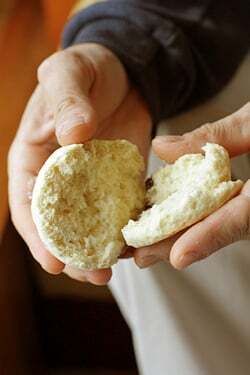 The Scone dough is rolled into a round and simply scored into wedges. I hope you managed to sign on for some of the keep fit classes or your Parisians will be chiding you soon on an expanded waistline! Always Wright: It’s funny because a number of people make the crossing, stay in NY for a few days, then head back on the boat. I think that’s the way to do it…although just 2 days in New York isn’t enough! Skippy: Yes, some of the cabins aren’t all that expensive; I think they offer different deals depending on when you travel, how full the boat is, etc.. There’s a bunch of those “cruise” travel boards and websites online where people trade tips about getting good rates and such. I would imagine if you keep an eye out, there’s a wide berth of options. 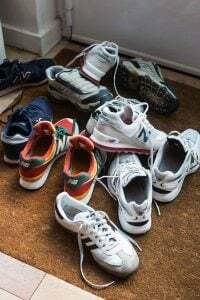 Sandra: I know, I have been going to some of the fitness classes, although the big activity on board seems to be walking or jogging around the deck of the ship. This morning is was really wet and windy, but beautiful in its own way – and just a few brave souls were out there – ! This voyage is now on my bucket list. Traveling on the QE2 was on my mother’s and I hope I have better luck at ticking it off the list than she has! Enjoy every minute. If you ever get tired of ‘noshing’ (as if! ), I’d love to hear what you think of the ship, the accommodations and other activities. I’ve often wondered about a transatlantic voyage but most of them take place in spring and fall when the cruise lines send their ships back and forth from the Caribbean to/from Europe, not the best times of year for an ocean voyage! 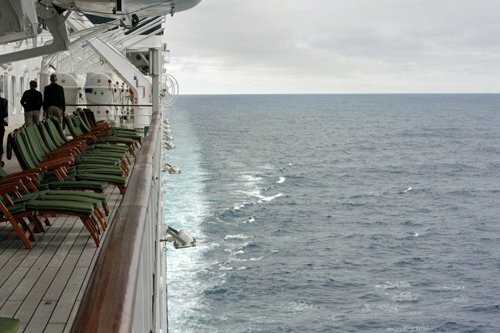 I have visions of clinging to the railings while giant waves wash over the decks. A quick glance at the webcam from your ship’s bridge today tells me this is definitely the season to travel this route. Are you playing any shuffleboard? Bridge? Is it more like a Fred Astaire/Ginger Rogers movie or the Marx Brothers? ‘An Affair to Remember’ or ‘Ship of Fools’??? what a fabulous post, I am vicariously sipping tea with you! I have found that good cruises make you leave the real world behind, and time becomes different, and meal times are a slower more enjoyable pace. Do you find that also? Enjoy! David, your blog makes me very happy. 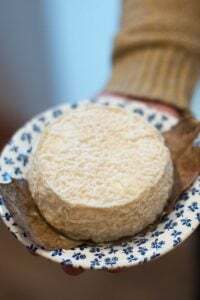 I love how you share with us all kinds of experiences and you never come across as a food snob. Instead, you share your perspective as just another individual who has his own likes and dislikes just like everyone else. Keep up the good work. If you are ever in San Diego send me an email and you and your man are welcome to come over for dinner or a drink sometime. Cheers. I read your post with great interest because I’m taking my first real cruise this August. (I’m not counting several day trips up and down the Rhine river or ferries from ports across from Germany to Denmark.) Ours will be a Norwegian ship, so I imagine we’ll see different ethnic touches than those you mention. As usual, thanks for a nifty post. Just returned from an Eastern Mediterranean cruise out of Rome. A trip of a life time, followed by a miserable 2 day flight back to California. I’m living vicariously through you, it’ll be awhile before we fly to Europe again. I’ll never forget seeing the QEII sail under the Golden Gate Bridge a few years back…love reading your blog! Since I did not find any other way to contact you, I decided to use this route. 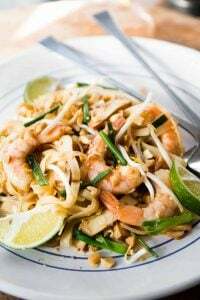 I was wondering if you would be kind enough to advise new food bloggers how to write recipes that sell. What is the secret of writing recipes that people would want to come back for more, or buying the writer’s cookbook, etc. Just adore your photography and website, beautiful! What a great article about your trip. The photos make me want to be there, and almost feel that I am. I have to admit that chocolate dessert in the photo looks quite scrumptious. The photo of rolling waves is incredibke. Thanks for sharing. Please, you must go to todd englishs restaurant on the liner, my husband and i ate there twice and the food and service was wonderful! Very excited for you! I did eat there. I’m going to write a little about it shortly! Wow! What fantastic pics you take! I am so enjoying seeing them and reading about your adventures on the QM2. Right now my daughter/hubby are flying across the other big pond to Australia. If you get down to Houston come see us. If you visit NASA we are just across the street from it. Or maybe we’ll see you at Target’s (from your book, The Sweet Life in Paris). Have a safe voyage! Wow! Sounds like a pretty cool trip. And those photos are amazing. Wow, what an amazing kitchen! Encore and hats off to the Executive Chef and staff. Indescribably clean–I hope it’s fun working there, too. 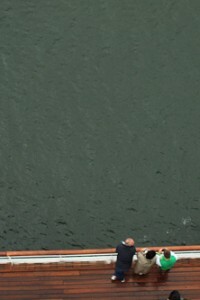 Really enjoyed your day’s photos and comments of the QM2. It made us really miss the QM2. We were on this wonderful ship July of 2010. If you have time please go to a show in the Royal Court Theater and tell the music director, Joey, that mom and dad say “Hi & we miss him”. The Queen Mary was the best, most relaxing ship we have ever been on, plus the food was so delicious! Such delightful photos. I like the idea of crossing the Atlantic because it’s there. 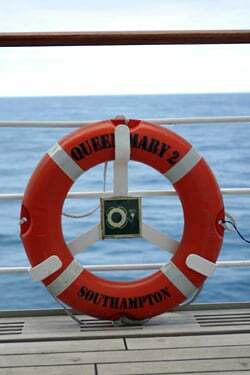 Love the photos; I did a crossing on the QE2 some time ago and have QM2 on my bucket list! And, you can order anything you want. Even if it’s not on the menu. Worried about what to do for a follow-up? Consider crossing the Atlantic on the Wind Surf, a five-masted sailboat with 350 passengers and a French chef. Once eastbound in spring, westbound in fall. Not a commercial message, just a rave from a past QM2 passenger. Those beautiful photos have made me start craving some bread and jam. I also just read your blog post about blogging, and wanted to thank you for such a thoughtful and well-written article. I’ve only been blogging for a few months, and it was very helpful to me! We will be doing this trip in novmebre for my 40th Birthday and I can’t wait Thanks so much for the sneak preview and for the Roiboss the one from Mariage Freres is very good !